"The Golden Age of Pinehurst-The Story of the Rebirth of No. 2" by Lee Pace. 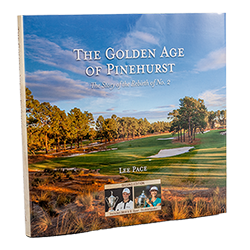 In this second edition, Lee Pace chronicles the breathtaking restoration of Pinehurst No. 2 back to a natural setting as originally designed by Donald Ross. This rendition includes events through the 2014 U.S. Open Championships.